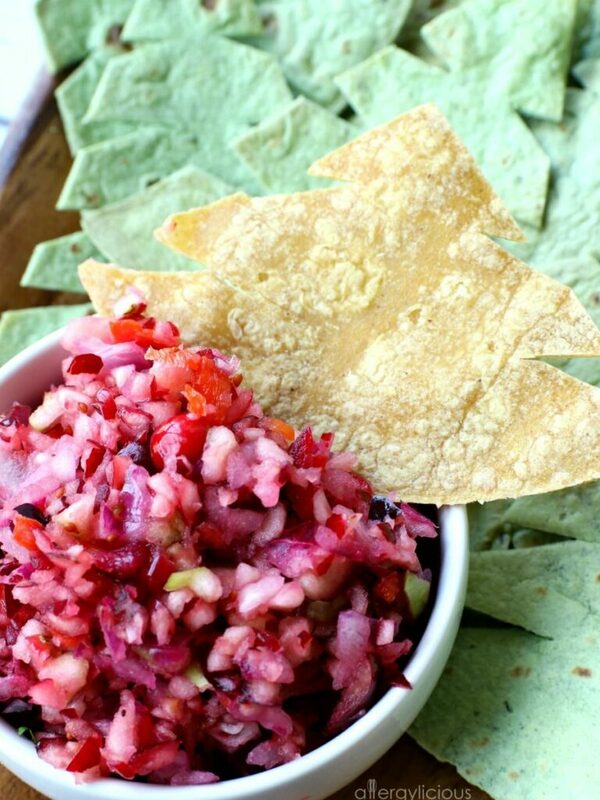 Tart & tasty, fresh & festive Cranberry Salsa with baked “tree” chips . 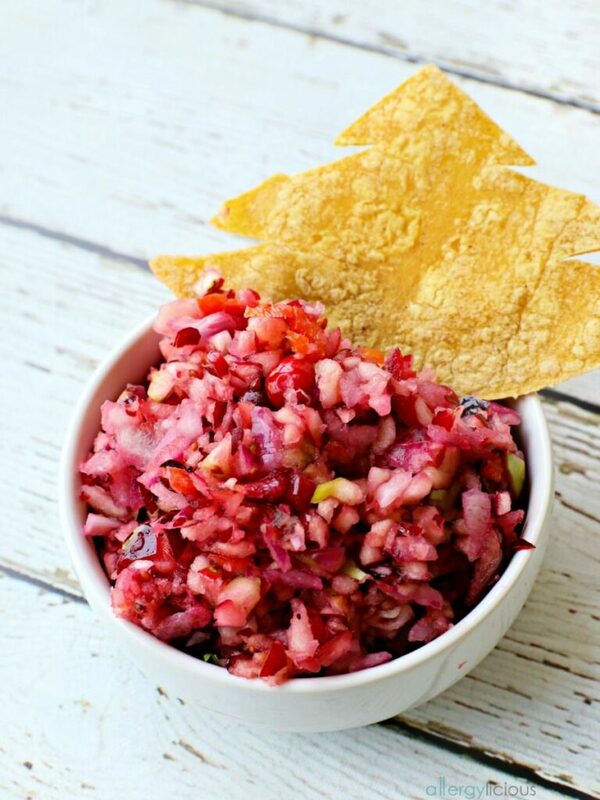 My early Christmas gift to you is this Cranberry Salsa recipe! 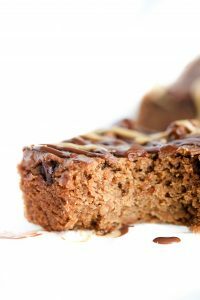 It’s the recipe that takes very little effort, but has a huge impact. 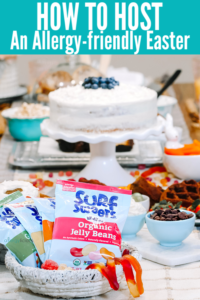 Everyone will be asking you for this recipe by the end of the night….trust me, that’s why I’m finally adding it to the blog. Why I haven’t shared this Cranberry Salsa before is unknown to me… I’ve been making it for over a decade now, so I guess it’s about time, right? Plus, with Christmas being next week, you’ll be needing this soon! So far, we have hosted 2 parties and I just made another batch for tomorrow’s Christmas get-together. Lot’s of parties, but thankfully this appetizer is incredibly easy and everyone loves it, so it’s a guaranteed party favorite! 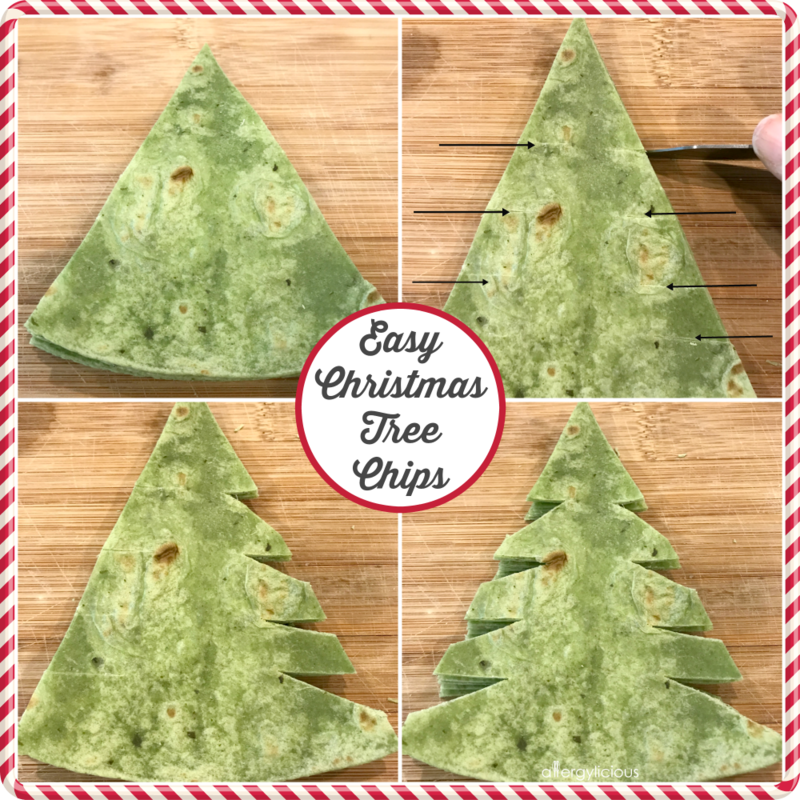 12 minutes is all you need to whip up a batch of adorable cut-out Christmas chips that will have all your friends raving! 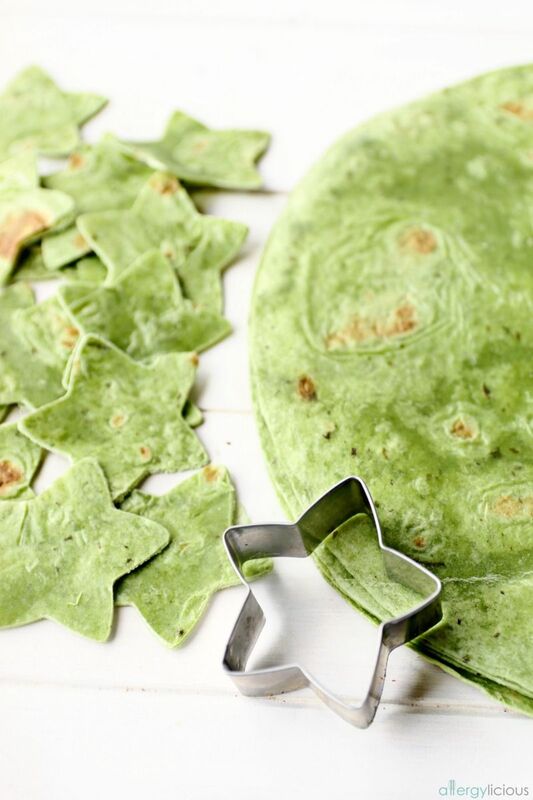 Rudi’s makes GF Spinach Tortillas that work perfectly for this recipe. I love that they are already the perfect shade of green and are free from nuts, dairy & soy (they don’t contain egg either). Mission Tortilla recently came out with a soft GF tortilla that I found in Target, so that would work too, although it’s not green. That’s right, all you need is a food processor or blender with the proper attachments and you’ll be making Cranberry Salsa in no time. Pulse all the veggies/fruit into the perfect dippable consistency, then transfer to a large bowl then stir in the remaining ingredients. Feeling a little lazy? Dump everything in at once and pulse until chopped. Just keep your eye on it so it doesn’t turn into cranberry soup. Watch how easy it is…..
Are you ready to get your “Dip on”? I know I am! Tomorrow night’s shindig is an Appetizer Theme so we will not only be enjoying Cranberry Salsa, but I’ll also be serving Hasselback Baby Potatoes & Vegan Oreo Truffles for dessert. YUM!!! Do you have any holiday parties or family get-togethers this week or next? What yummy dishes will you be serving to your guests? Be sure to Print off and/or Pin our Cranberry Salsa, then comment below! I just love hearing from you all. Heat oven to 375° . Stack tortillas and cut in half then half again. Make slices to make into a tree shape or use cookie cutter. 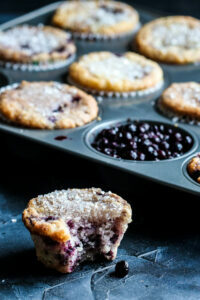 Place on ungreased cookie sheet and bake 8 minutes or until crisp. Remove to a wire rack and cool. While trees are baking, make the salsa. 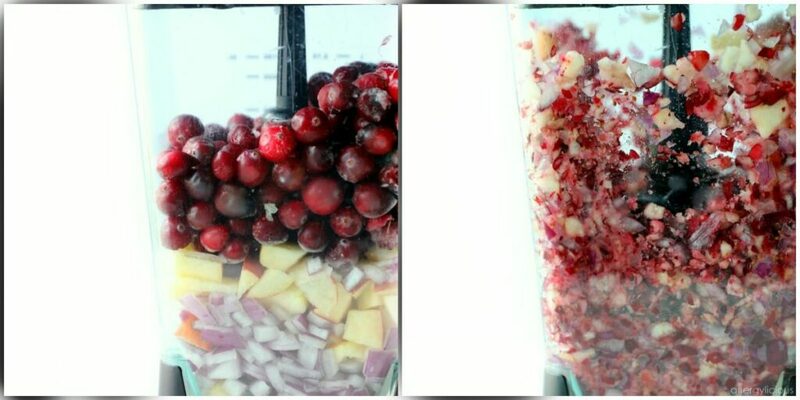 Put cranberries, apple, red pepper, onion and jalapeños in food processor and pulse a few times. Add in sugar, apple juice, lime zest and pickled jalapeño (if using) and pulse a few more times until chopped. Spoon into serving dish or glass bowl. Cover and refrigerate until ready to use. Serve with baked tree chips or premade chips of choice.